A new poll from Alvara concurs with last week’s LSI data and shows Widodo’s lead intact. A TV debate between the VP nominees was largely perfunctory, and Prabowo’s running mate Sandiaga Uno failed to use the opportunity to make up ground in the presidential race. The KPK arrested Romahurmuziy, an arder Widodo supporter and chair of the Islamic United Development Party (PPP); this reflects poorly on the president at an awkward time, but is unlikely to cause significant damage. Both exports and imports slowed precipitously in the Jan-Feb period, although capital-goods imports held up. Politics: The 17 March vice-presidential debate featured few stellar moments, but President Joko Widodo’s running mate Ma’ruf Amin generally outperformed expectations. He commanded detail without perpetrating major gaffes. Although Prabowo Subianto’s running mate Sandiaga Uno performed with eloquence, he lacked resonance and failed to make the compelling breakthroughs that his ticket needs (Page 2). Officials in Prabowo’s campaign reiterated suspicions about inaccuracies in the voter list. To be sure, maladministration has been chronically problematic, producing inaccuracies in the list – but alleging conspiratorial intent would be far-fetched (p. 3). Widodo urged supporters to encourage voter turnout, counter hoaxes and avoid complacency (p. 4). Surveys: The Alvara Research Institute measured Widodo’s lead over Prabowo at 19 percentage points in a poll conducted in late February and early March. This generally corroborates recent findings from the Survey Network (LSI) (p. 5). Disasters: In Sentani, outside the provincial capital of Jayapura in Papua Province, flash flooding and mudslides killed at least 73, with 60 others still missing (p. 6). Justice: United Development Party (PPP) Chair Romahurmuziy entered custody as a suspect on charges of graft. Investigators from the Anti-Corruption Commission (KPK) believe he took bribes in exchange for arranging senior appointments in the Religion Ministry, which PPP’s Lukman Saefuddin heads. If so, the case would mark the latest in a long line of Religion Ministry corruption scandals, and the second to embroil a PPP chair. The affair is an embarrassment at a crucial time for Widodo, but the details do not implicate the president and the KPK has refrained from pursuing Saefuddin, for now. Romahurmuziy has enthusiastically supported Widodo and he championed the VP candidacy of Amin; nonetheless, the PPP figure still lacks national prominence and his disgrace seems unlikely to materially affect the election (p. 7). Testimony from a Bekasi official sheds more light on Lippo Group practices in the Meikarta bribery case (p. 8). Policy News: The coordinating economics minister suggested penalizing district‑level governments that lack detailed spatial plans, which are crucial for a planned online investment permitting system (p. 9). Produced since 2003, the Reformasi Weekly Review provides timely, relevant and independent analysis on Indonesian political and policy news. The writer is Kevin O’Rourke, author of the book Reformasi. For subscription info please contact: <[email protected]>. 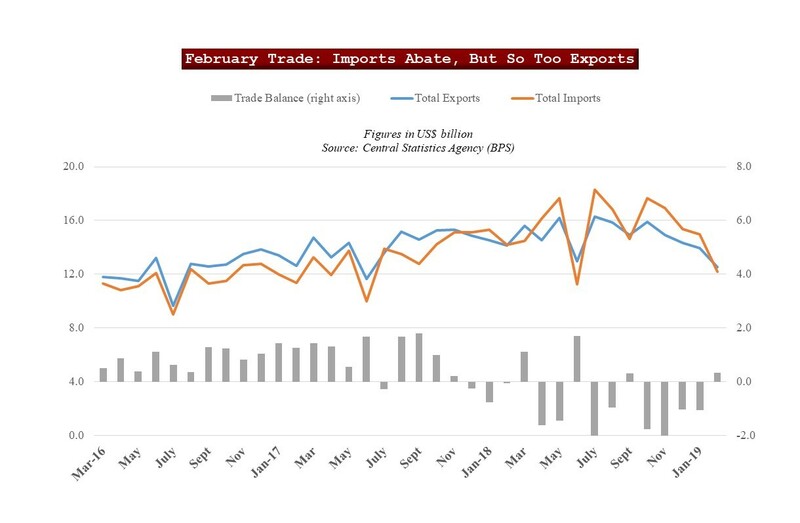 Economics: The finance minister registered caution about the trade surplus recorded during February, as exports underperformed while imports fell even further. But capital goods imports have held up (p. 10). 3. Recession Jitters: The New Fashion?